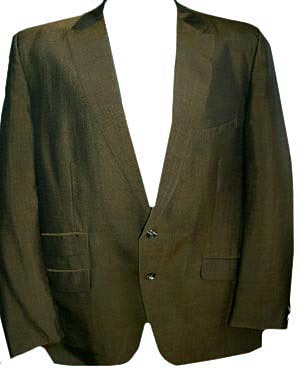 Men's vintage 1950s sharkskin jacket. Its that cool blend of gold-brown-olive that is so tough to capture on camera. Thin peaked lapels BUT not as thin as a 60s jacket- looks more like 50s. 2 button closure. 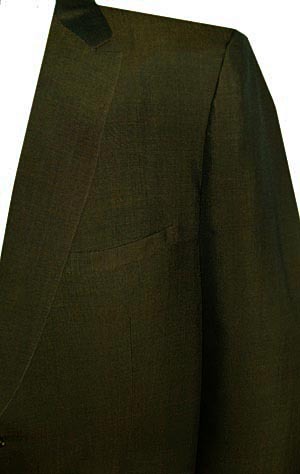 4 front pockets- the left pocket has another smaller pocket right above it. Center vent. 1950s-60s Union label. 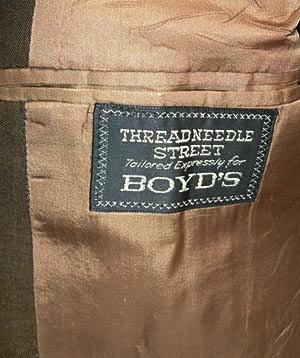 Store label reads "ThreadNeedle Street tailored expressly for Boyd's." Very nice looking blazer! Condition: Good +++. 3 small snags on the left shoulder- not holes though. Rough tip on the right collar point. Dark smudge on the right sleeve- kinda blends in but is visible when you look for it. Very VERY wearable- these are very minor things. priced accordingly.